Rice is one of the most commonly known gluten free grains. 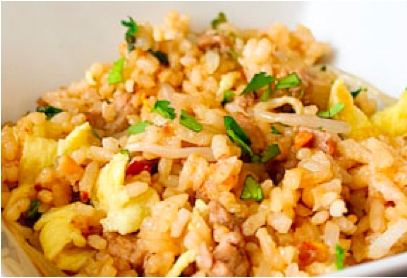 Rice is a staple grain for more than half of the world’s population. I prefer to use pre-soaked or pre-spouted brown rice whenever I can. To pre-spout brown rice, soak washed brown rice for 20 hours in warm water prior to cooking it. This process stimulated germination, which activated various enzymes in the rice. This increases the amino acid profile in the brown rice and also aids in digestion. This does create a softer, stickier texture to the cooked rice. To cook brown rice: Place 1 cup of rice and 2 cups water or stock in a saucepan with a tight fitting lid. Bring water to a boil over high heat. Cover pot and lower heat to low. Steam should keep coming from under the lid, but not boil over. DO NOT peek! You will loose moisture you need to cook your rice properly. A glass lid is a good idea if you are unsure about how your rice is cooking and would like to keep an eye on it. Rice will be cooked in 45 minutes. Turn off burner and remove from heat. Let rice sit, covered for an additional 10 minutes. Remove lid and fluff the rice with a fork to separate the grains. To cook long grained white rice, such as basmati or jasmine: Place 1 cup of rice and 1 1/2 cups water or stock in a saucepan with a tight fitting lid. Bring water to a boil over high heat. Cover pot and lower heat to low. Steam should keep coming from under the lid, but not boil over. DO NOT peek! You will loose moisture you need to cook your rice properly. A glass lid is a good idea if you are unsure about how your rice is cooking and would like to keep an eye on it. Rice will be cooked in 20 minutes. Turn off burner and remove from heat. Let rice sit, covered for an additional 5 minutes. Remove lid and fluff the rice with a fork to separate the grains. To cook rice for pilaf: For pilaf dishes, rice is sautéed in oil in order to keep the grains separated during cooking. Cook the dry rice in oil, stirring constantly, for 2 to 3 minutes or until the rice becomes translucent before adding the cooking liquid.